1. 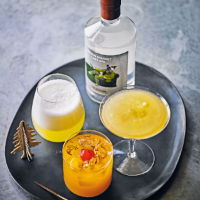 Shake the lemon juice, gin, pasteurised egg white and sherbet powder for 30 seconds vigorously in a cocktail shaker. 2. Fill the shaker with some ice and shake again for an additional 30 seconds before straining the mixture into a highball glass. 3. Fill to the rim with soda water and lightly dust with a little sherbet to finish.